Investors have a lot to chew on Thursday, and a slew of economic reports could influence whether they send U.S. stocks to a new round of record highs. Stock futures remained mixed after the government reported that jobless claims were up from a week ago. Additionally, housing starts for April fell and were below forecats. A key measure of inflation, the Consumer Price Index, also fell. At 10:00 a.m., Thomson Reuters and the University of Michigan will release their consumer sentiment index. In corporate news, Wal-Mart (WMT) reported better-than-expected quarterly earnings but a decrease in same-store sales. The company said it was held back by a delay in income tax refunds. The retailer's stock slipped in premarket trading. Kohl's (KSS) stock price jumped after the retailer beat its own guidance in quarterly earnings, despite a dip in profit. Dell (DELL) and J.C. Penney (JCP) report earnings in the afternoon. Tesla (TSLA) shares rose after the electric-car maker announced it was raising capital to repay its government loan early. CEO Elon Musk plans to personally buy $100 million worth of stock. Cisco (CSCO) shares surged after the tech giant topped earnings and sales forecasts. Japan released data overnight showing that its economy grew at an annual rate of 3.5% in the first three months of 2013. The expansion was much stronger than the 2.7% increase expected by analysts. Despite the good news, Asian markets ended mixed. The Nikkei, dragged lower by disappointing guidance from banks, declined 0.4%. The Shanghai Composite added 1.2% and the Hang Seng increased 0.2%. U.S. stocks continued their rally on Wednesday, with the Dow and the S&P 500 once again hitting all-time highs. 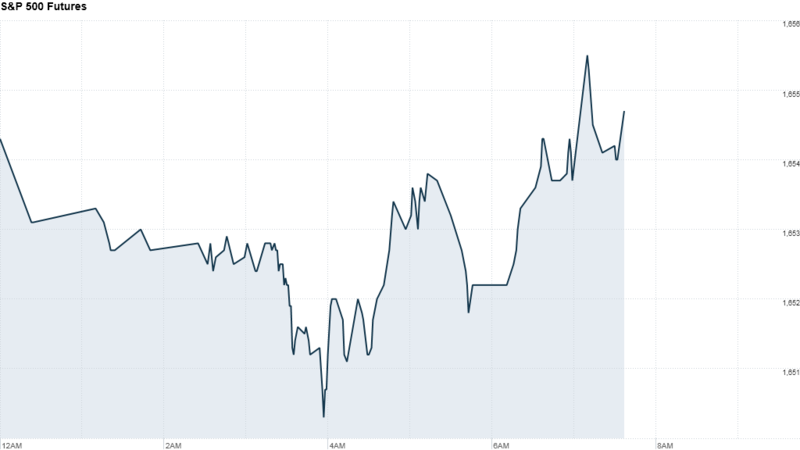 European markets are were mixed in midday trading. The DAX in Frankfurt and the FTSE 100 in London were higher, while the CAC 40 in Paris was slightly lower.